I'm not usually a fan of using words such as “ultimate,” “amazing” or “best ever” in a review. But, there are certain destinations and experiences that deserve superlatives. This is certainly the case for my most recent liveaboard trip aboard the Galapagos Sky. The Galapagos Sky at rest in front of the famous Arch at Darwin Island. Straddling the Equator, 590 miles west of South America’s Pacific Coast, the Galapagos Islands showcase a biosphere that once inspired Darwin's theory of evolution. On islands and surrounding rock formations, marine iguanas, giant land tortoises and tropical seabirds capture the imagination. And the diversity isn't confined to the land. Inside the 140,000 square kilometer marine reserve that surrounds these islands, species such as sea lions and penguins, normally indigenous to cooler regions, live side-by-side with a host of sharks, reef fish and sea turtles commonly found in more tropical climates. 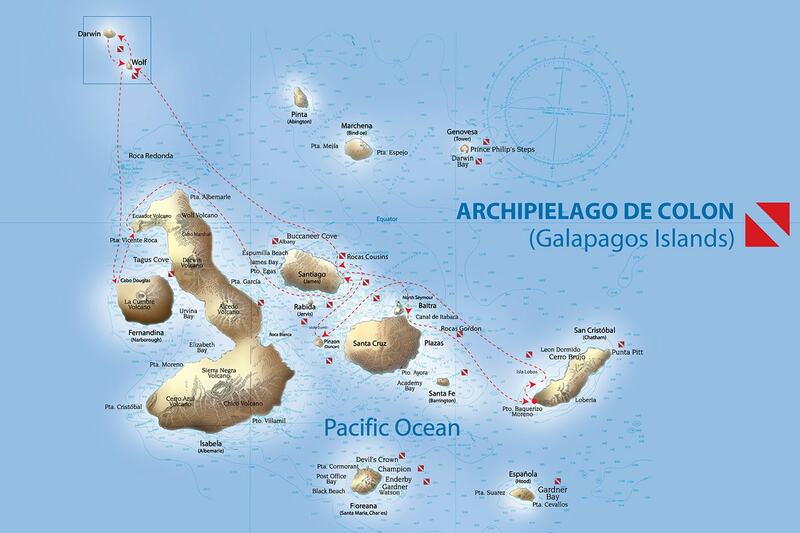 A typical one-week itinerary for the Galapagos Sky. The prolific range of marine life found in these waters results from the convergence of five major oceanic currents that converge on the lonely cluster of islands on the equator. When the South Equatorial Current arrives from the west, it is joined by the colder, plankton-rich Humboldt Current. This cool, nutrient-laden water is further enriched by deep upwelling’s generated by the Cromwell or Equatorial Undercurrent, which brings up even cooler nutrient-laden water. When the three currents mingle and rise to sunlit depths, it creates ideal conditions for massive plankton blooms, which are essential for seabirds and larger forms of marine life. 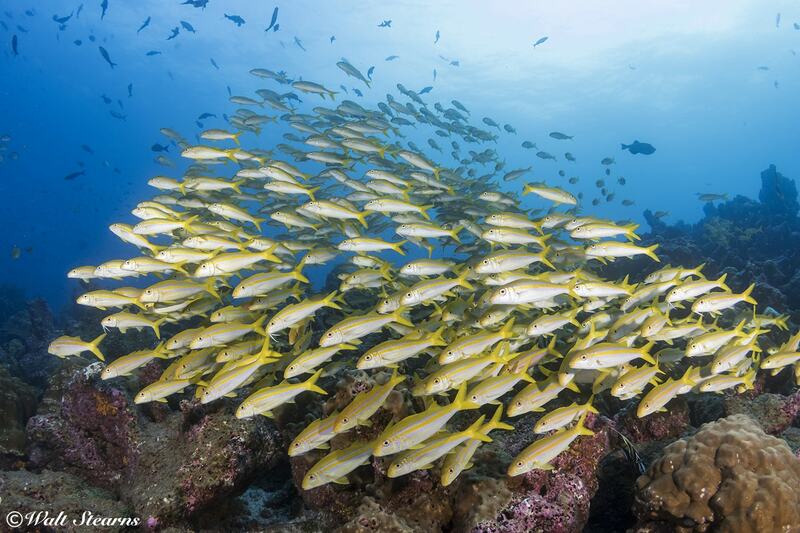 A school of goatfish hovers over a coral-covered rock off Darwin Island. The variety of cetaceans in the Galapagos is impressive and includes bottlenose dolphins, pilot whales, false killer whales, orcas and sperm whales. At times, these waters are even visited by the ocean's largest creature, the blue whale. During my most recent trip, we were fortunate to see one of these majestic leviathans pass in front of our bow while on the way to Fernandina Island. 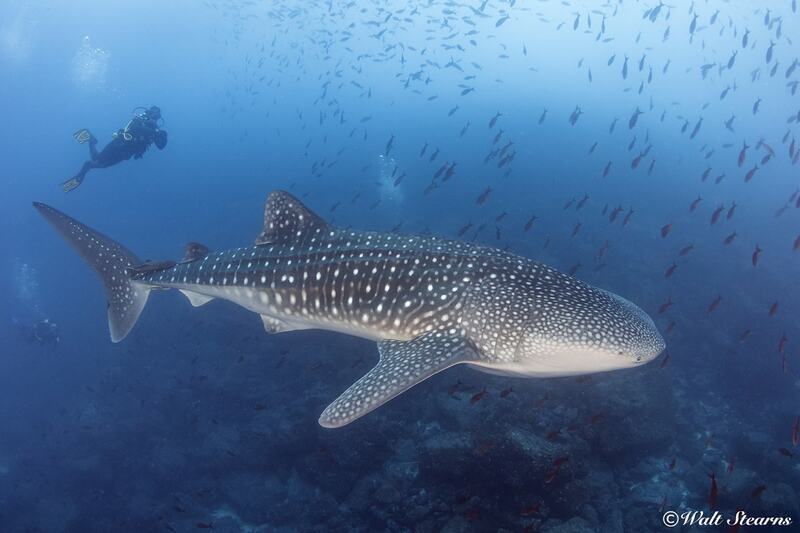 There is a chance of seeing whale sharks at any time of year, but the odds increase when cooler waters arrive in the months from July through November. The M/V Galapagos Sky is a purpose-built liveaboard launched in the year 2000 by Santiago Dunn and operated under the name of Sky Dancer as part of the Peter Hughes fleet. My first introduction to this boat was in 2001 when I spent a memorable week enjoying a winning combination of good food, good service and exceptional diving. 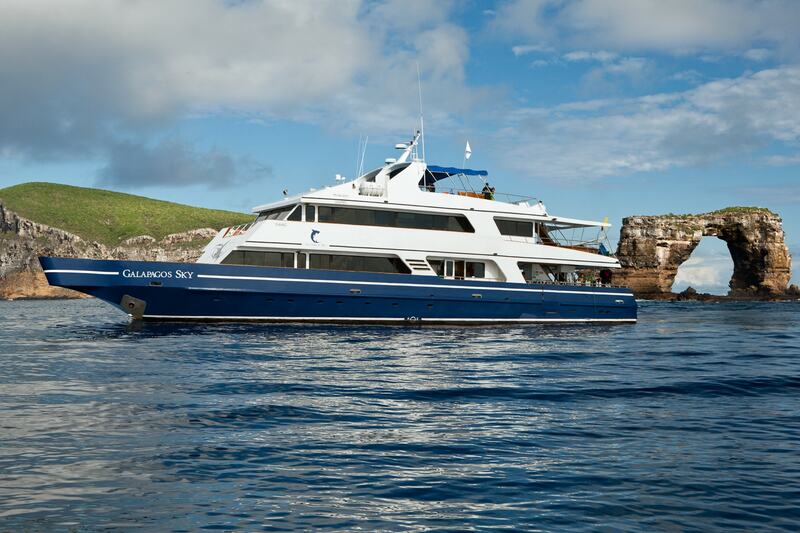 Today, the parent operation is known as Ecoventura, and the Sky is considered one of the premier luxury liveaboard dive yachts in the Galapagos. 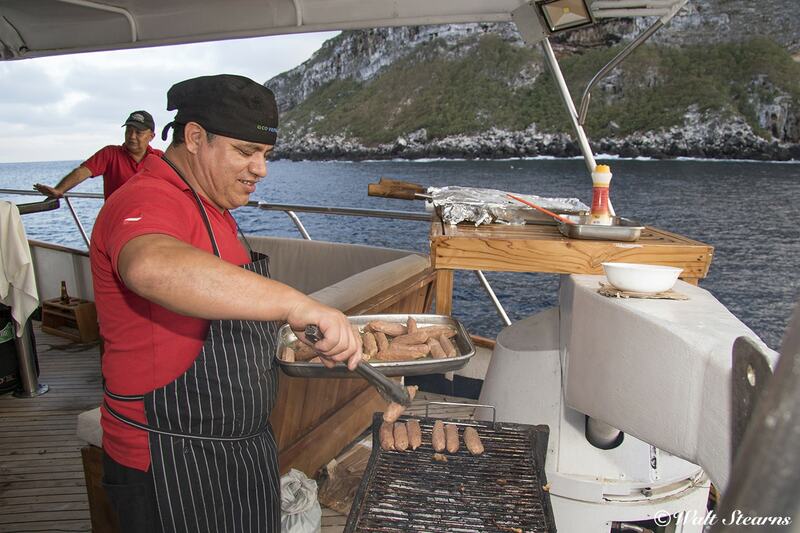 The chef makes use of the grill on the upper deck of the Galapagos Sky. My most recent visit to the Sky was in 2016. And now, I'll use one of my infrequent superlatives to say that I was “ecstatic” to be back aboard. There was an immediate sense of familiarity, as the boat is obviously maintained to a high standard, and offered the same comforts and amenities I remembered. 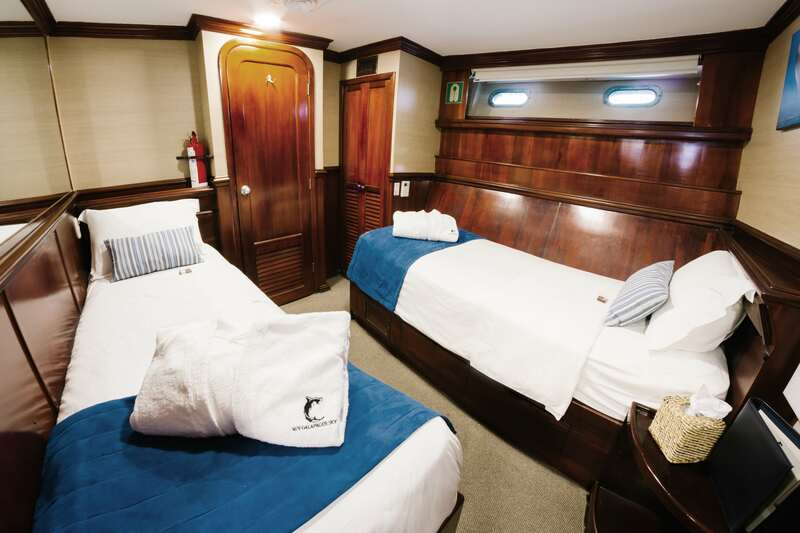 Master staterooms feature large picture windows and the option of two twins or a single king-size bed. Guest accommodations aboard this 100-foot yacht include eight private en-suite cabins, hosting a maximum of 16 passengers. 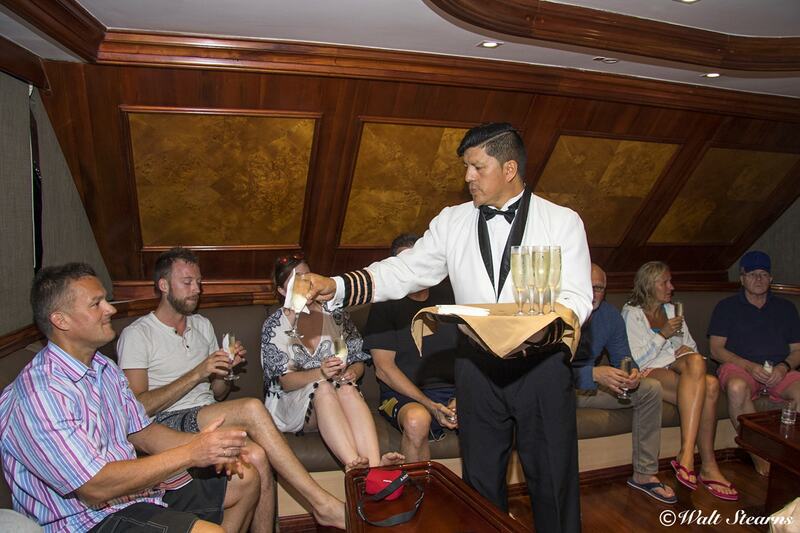 Cabins are split four-and-four, with four Master Staterooms on the upper Dolphin deck, and four Deluxe Staterooms located just below on the Iguana deck, which also holds the main saloon. The Masters command a slight premium, as they have a bit more interior space, offer the option of a king-sized bed or two twins, and have large picture windows. 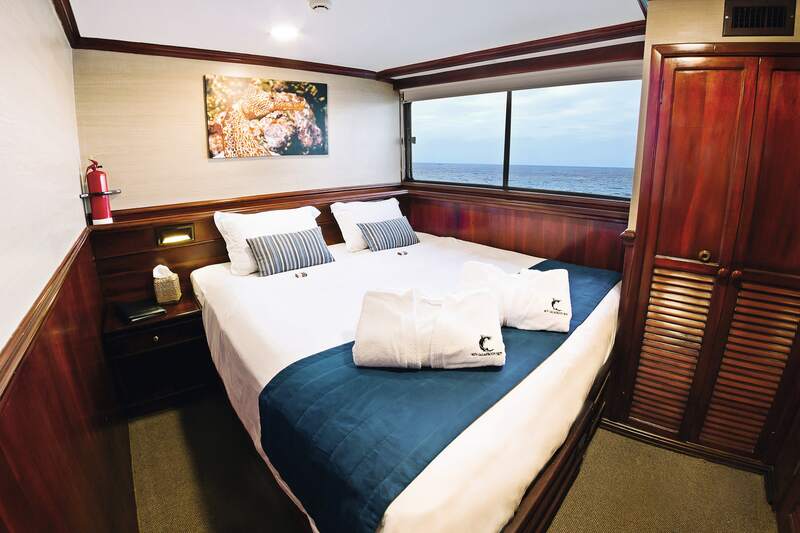 All staterooms provide individual climate control and include a private head and shower, where guests will find a mirrored cabinet and wardrobe, bathrobes, hairdryer, and marine-safe biodegradable toiletries. Deluxe Cabins are trimmed in rich woodwork and offer twin beds and a private en-suite bathroom. The interior décor of the Sky has a very yacht-like feel, with polished hardwood floors and furnishings. The booth seating of the dining is reminiscent of an upscale restaurant, and each table enjoys ocean views through large picture windows. The saloon area includes a large wrap-around settee that invites mixing and mingling. All furnishings have undoubtedly been replaced more than once since my first visit because everything from the upholstery to the trim work looked brand new. Even the saloon’s bar seemed to have benefited from some upgrades. The dining area of the Galapagos Sky has the feel of an upscale restaurant, and also serves up exceptional water views. The Sky’s eight-member crew follows the Peter Hughes tradition of passenger-pampering, from nightly turndown service in your cabin to morning coffee delivery, and attentive meal service that creates a refined ET not overly pretentious ambiance. The menu varies between international fare and local recipes, and all beverages including wine and beer are gratis with dinner during the voyage. Divers gather for a post-dive libation in the main saloon, which is the social hub of the Galapagos Sky. 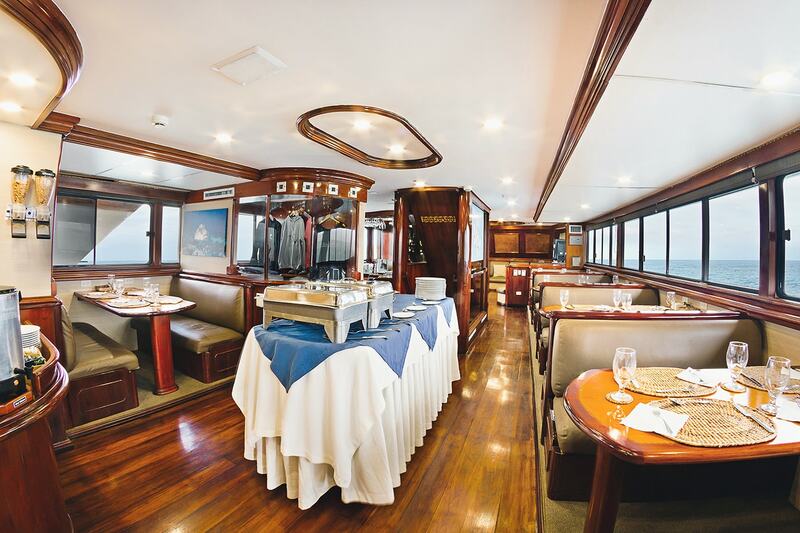 Of course, the real meat and potatoes of any liveaboard dive yacht is the dive deck. The Sky’s large, semi-enclosed aft dive deck is well designed to accommodate up to 20 divers (18 guests, two guides), and all are able to suit-up at the same time without bumping into one another. There is individual gear storage beneath each diver’s station on the bench seats, and heated fresh water showers for rinsing after the dive. The deck also includes a large two-tiered camera table and a separate charging station with 110 and 220-volt power. The camera rinse tank can hold about three full-size DSLR systems at a time, so when there are a lot of serious photographers aboard, the usual post-dive protocol is to dunk once and move the camera to the table. In addition to offering cameras and Scubapro brand dive equipment for rent, the Sky provides complimentary 32 percent nitrox for qualified divers. In my opinion, if you are not already nitrox certified, get it before you go! 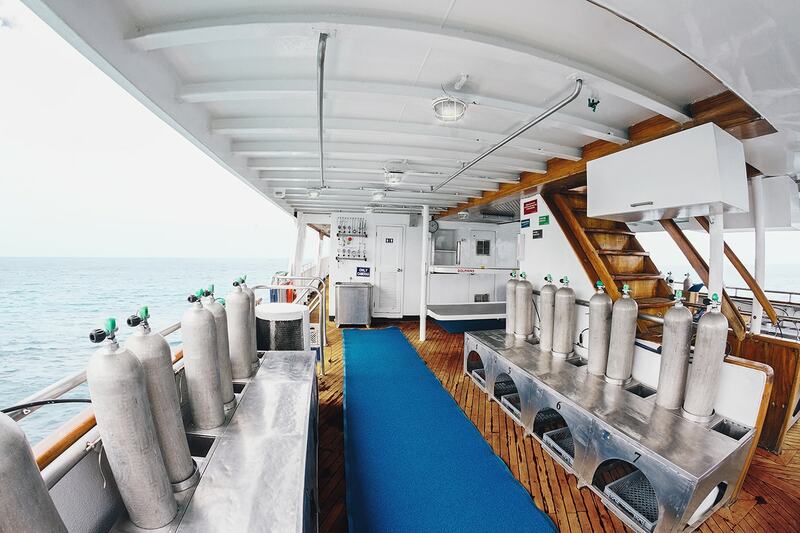 The well-organized dive deck of the Galapagos Sky provides each diver with ample space for gearing up, along with personal storage space below the bench. The Galapagos is a dream destination for many, but probably not the best place for new divers who have yet to master buoyancy control or their overall comfort level in the water. Currents are present on nearly all dives, sometimes mild but other times quite strong. And don't pack a tropical-weight wetsuit, because although these islands straddle the equator, the water can be surprisingly chilly, with temperatures sometimes getting as low as 50 to 58 degrees Fahrenheit. 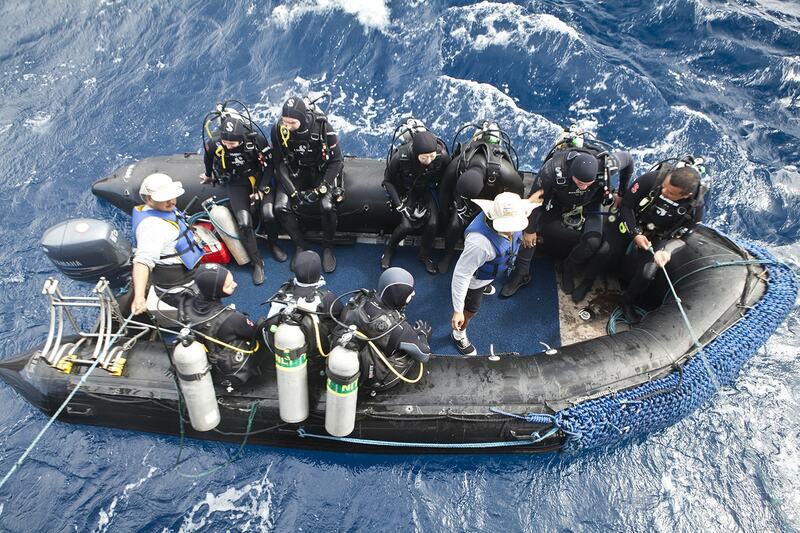 The Galapagos Sky's dive team handles all gear transfer between boat and the launches. All divers need do is step aboard. Because conditions at most sites are not conducive to diving from an anchored or moored boat, the Galapagos Sky conducts all dives from 22-foot, outboard powered inflatables. 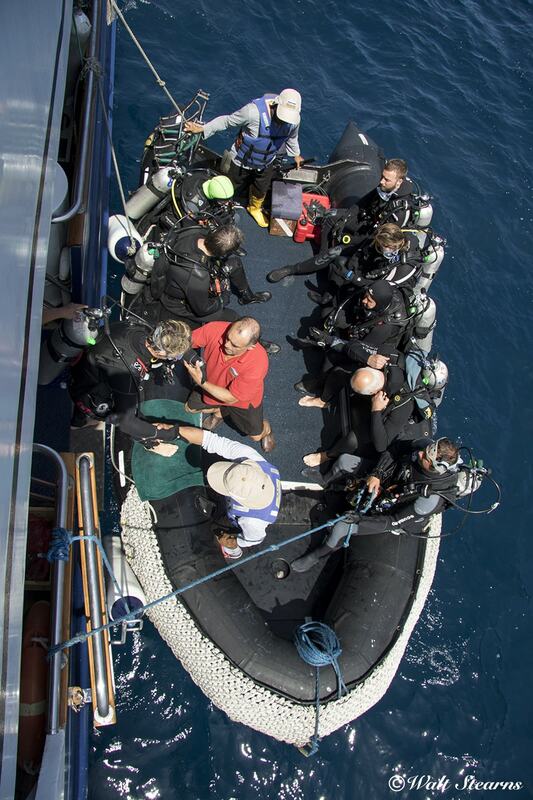 After a thorough and entertaining pre-dive briefing on the aft deck, the crew loads all gear into the launches for a short run—usually five to ten minutes— to the starting point of the dive. Each launch carries up to eight divers, plus a divemaster/guide. As a matter of protocol, all dive guides working in the waters of the Galapagos are trained Park Naturalist, in addition, being a certified dive instructor or divemaster. All dives from the Galapagos Sky are conducted as drifts staged from a pair of 22-foot inflatable launches. The Sky’s 8 days / 7-night cruise itinerary covers 5 1/2 days of diving. From the mainland airport in Guayaquil, Ecuador, guests typically catch a flight that arrives on the island of San Cristobal around noon on Sunday. After paying a $100 park fee (cash only), they are then transported to the boat for introductions and other formalities such as required safety briefings and a vessel orientation. That afternoon, there is time for a check out dive at a nearby site, which gives everyone a chance to get accustomed to the boat's diving practices in a non-challenging environment. 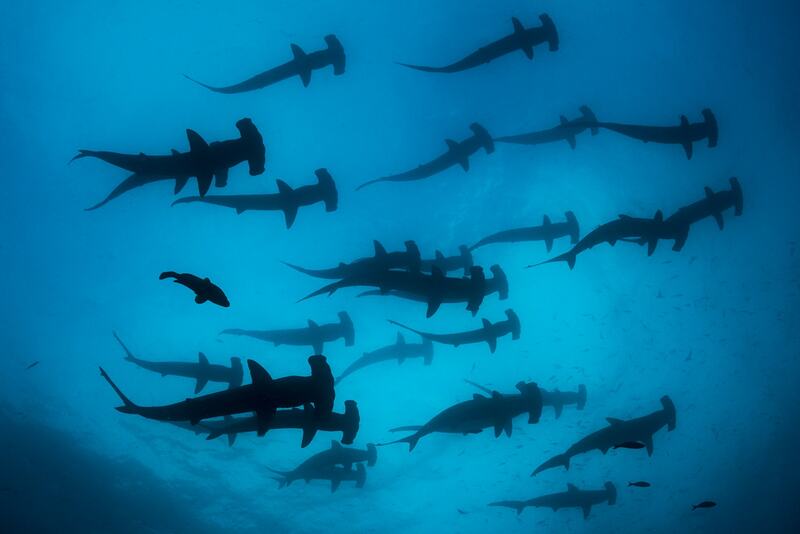 The Galapagos Islands are one of the few places in the world where divers can encounter large schools of scalloped hammerhead sharks. From San Cristobal, our trip began with an overnight move to Santa Cruz Island to dive at Punta Carrion and the northeast tip of Isla Pinzon. 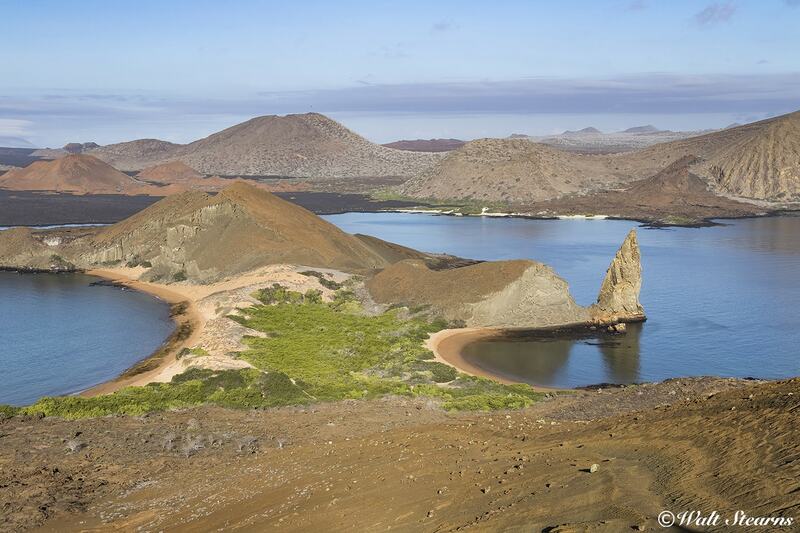 These sites are a great introduction to Galapagos waters. Most profiles run from 40 to 90 feet over volcanic rock and sand bottom, and the marine life in this area is extremely varied. On any given dive you can expect white-tipped reef sharks, marbled stingrays, green turtles, Galapagos fur seals, sea lions, eagle rays, cownose rays and mobula rays swimming in formation. My favorite smaller find is the region’s indigenous red-lipped batfish, which has lips so red it would make Revlon cosmetics jealous. 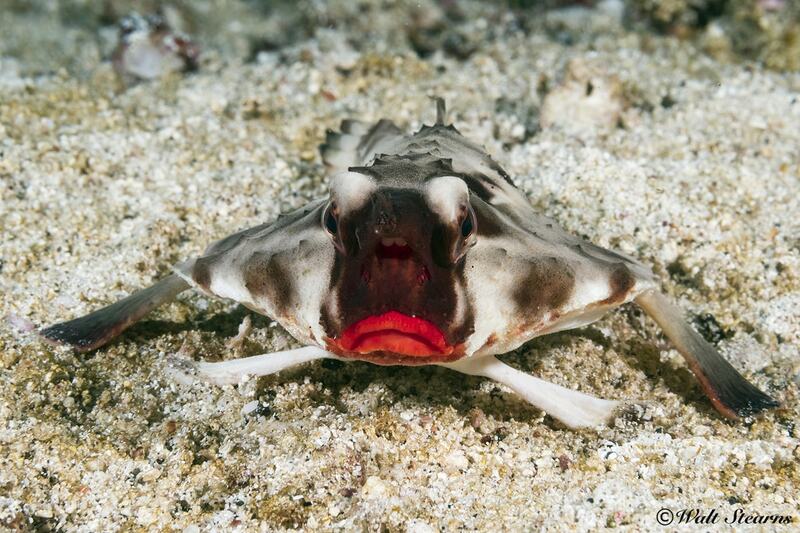 The red-lipped batfish is one of the more interesting small finds that await in the waters of the Galapagos. Following our third dive at Punta Carrion, the Sky set sail for the Wolf-Darwin volcanic ridge, which lies some 100 miles to the northwest. The voyage takes 16 to 18 hours over the predominately open sea, where wave heights frequently running three to six feet. The small, uninhabited islands of Wolf and Darwin are the eroded crests of extinct volcanoes that rise from depths of more than 3,000 feet to become towering rocky precipices that soar 500 to 800 feet above the sea. The most famous site in this area is the Arch at Darwin Island. 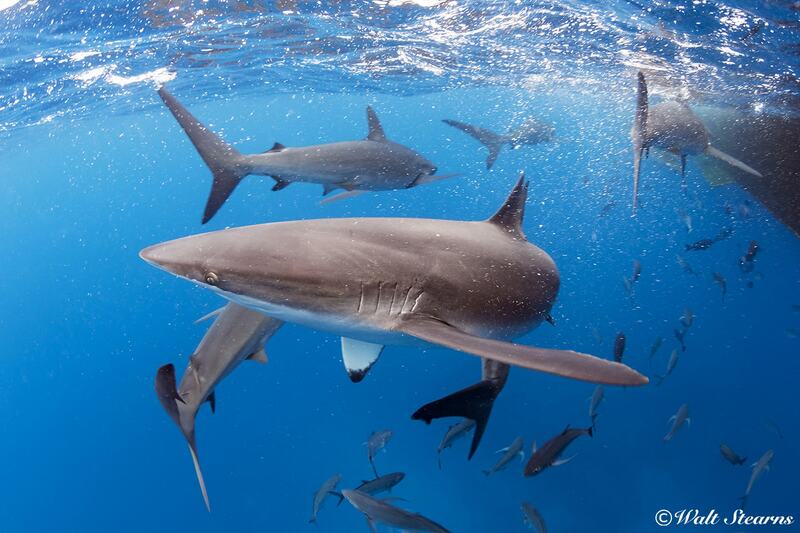 Silky sharks are not usually considered a coastal species, but they can be found along the shores of a number of the islands of the Galapagos, as well as right next to the Galapagos Sky itself. 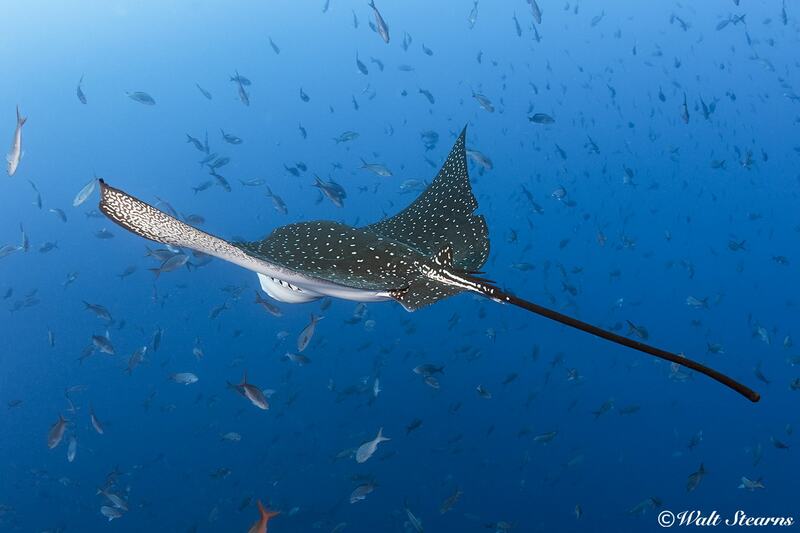 Eagle rays are frequently seen gliding along slopes and walls at dive sites across the Galapagos Islands. The waters surrounding the Arch are a dynamic zone, where currents and surge converge around the submerged promontory of Darwin Island. In the course of a single dive, you may find schooling hammerhead sharks, large numbers Galapagos and silky sharks, eagle rays, thick schools of skipjack and yellowfin tuna, and even a pod or two of bottlenose dolphins. In the months from June to September, this is the place to be for encounters with truly large whale sharks, which may reach lengths of 45 feet. Another diver favorite is the massive schools of bigeye jacks that form giant swirling funnel-shape formations known as Jack-nados. Other times, the jacks may appear like a massive blue steel wall, large enough to conceal a 40-foot whale shark. It can be quite a surprise when a shark breaks through this curtain. 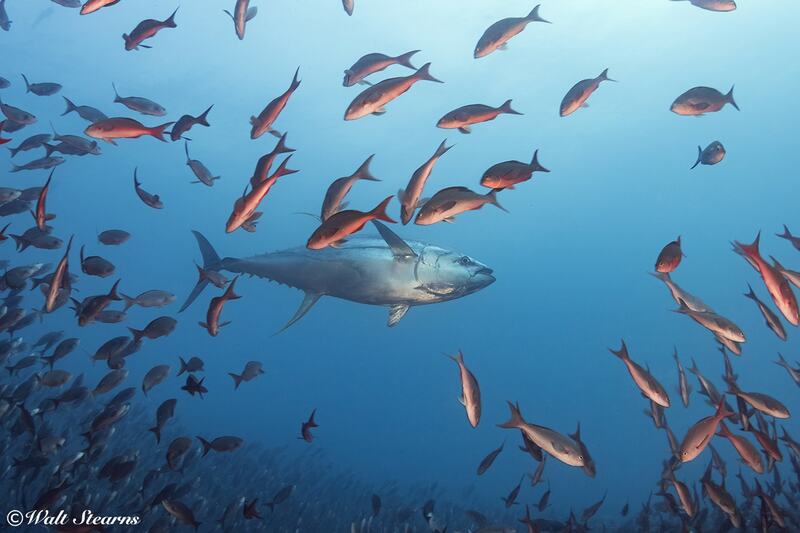 The Galapagos Islands are one of the few dive destinations where there is a good chance of seeing open-water species such as yellowfin tuna. While waters the islands to the south are generally cool, Darwin and Wolf are influenced by the warmer waters of the Panama Current and the North Equatorial Countercurrent. The convergence of the two brings water temperatures that can rise as past the 80-degree mark during the months from December through March. One of the more obvious indicators of this warmer water is the higher number of hard corals present. But even the rocks not covered with coral are seldom barren and are often carpeted with layers of barnacles sharp enough to do a nasty job to a prized wetsuit or ungloved hand. During the months of June through October, water temperatures fall into the cool range of 69 to 75 degrees. But these are also the best months for encounters with Darwin and Wolf’s big-ticket encounters, from packs of Galapagos, silky and schooling hammerhead sharks to whale sharks. 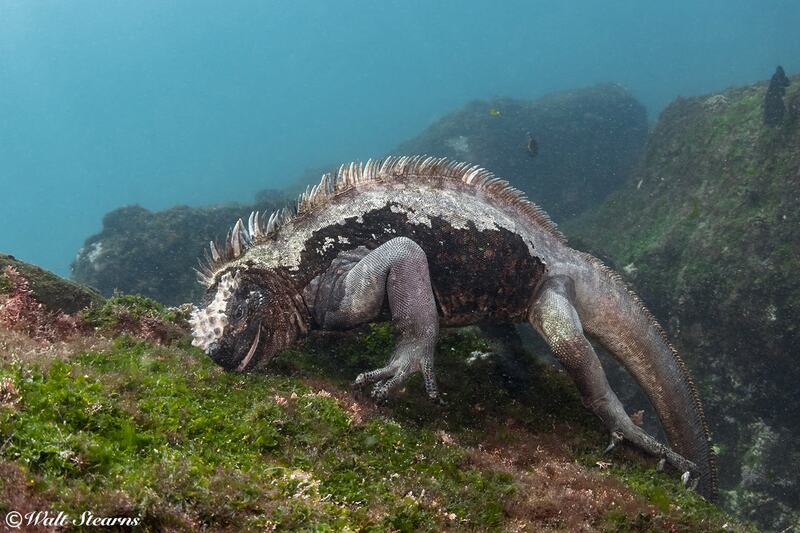 Marine iguanas are air-breathing reptiles, but they can hold their breath for up to half an hour, and dive to depths of 100 feet to graze on algae. On the way back to port, we hit Cousins Rocks near Bartolome. This site is a large volcanic pinnacle awash in marine life, including large schools of barracuda, eagle rays, sea lions and sea turtles. Also interesting was a unique yellow-colored variety of black coral growing on the more vertical profiles. If you allow time to search the corals, there are opportunities for finding longnose hawkfish, frogfish and seahorses among the branches. The volcanic slopes of Bartolome Island make for dramatic landscape photos. A shore excursion to the Highlands of Santa Cruz to see the islandGÇÖs indigenous species of Galapagos Tortoises in their natural environment is often arranged for guests on the Galapagos Sky. 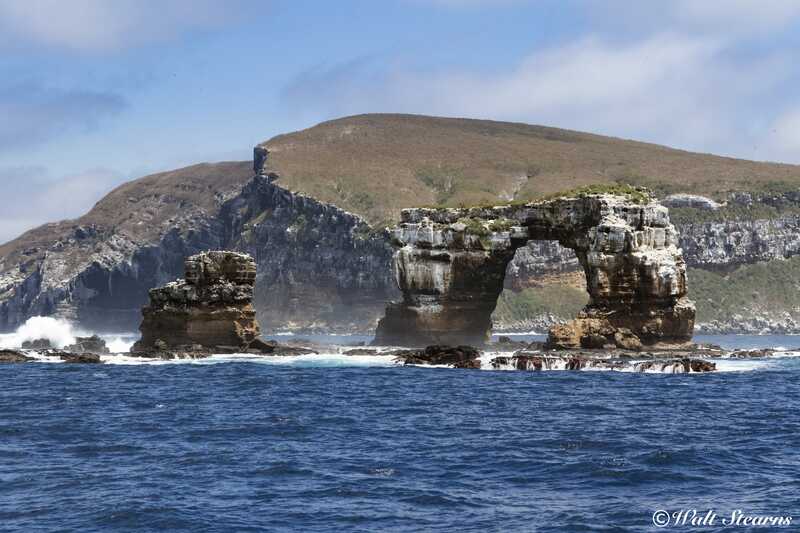 In addition to serving as dive platforms, the Sky's launches are used to cruise the shorelines and rock outcroppings, which are home to penguins, flightless cormorants, marine iguanas, sea lions, blue-footed and Nazca booby birds, magnificent frigates and noddy terns. There are also a limited number of opportunities for land excursions. The Galapagos Park Authority sets the rules for land tours conducted by live-aboard dive boats, which are usually confined to Bartolome Island. This tour lacks the wildlife you would expect to see in the Galapagos, the island’s volcanic shoreline and hillside offer their own brand of raw beauty. Guests can climb to the island's summit for breathe taking views. 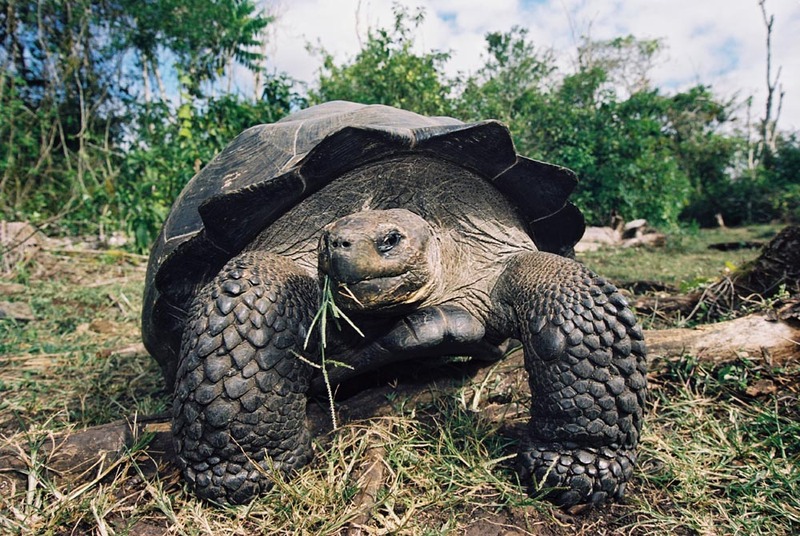 During the Sky’s return back towards port on Saturday, an additional land tour is generally offered to visit the highlands of Santa Cruz to see the island’s indigenous species of Galapagos tortoises in their natural environment. Once back in San Cristobal, a final morning land excursion is offered to the Interpretation Center, which offers a lot of interesting natural and human history of the Galapagos. Afterwards, there's time for a walk through town before going back to the airport for a late-morning departure. Just off the shore of Darwin Island, the rock formation known as the Arch sits at the convergence of ocean currents and coastal surge, creating a dynamic underwater environment.